For those, who have money to spend without counts, an Italian manufacturer has designed one of the most expensive LCD TVs in the world. The opulent ‘Yalos Diamond’ TV set is studded with 160 real diamonds worth 20 carats unlike the swarvoski encrusted Loewe’s LCD TV from CY Digital or the other shiny home appliances including Gorenje Touch Fridge-freezer that were all decked-up with swarovski crystals. The ‘Yalos Diamond’ TV flaunts a cool price of $130,000. 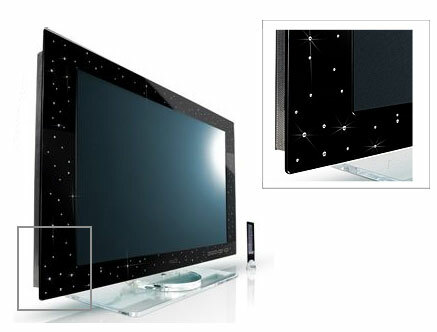 If you think, nothing could outdo Panasonic’s 103-inch plasma, not even Philips Ambilight LCD prototype then will love to hear what you have to say about this ultra-luxurious LCD TV from the Italian manufacturer, Keymat Industrie which is counted not by its size but by its diamonds! !